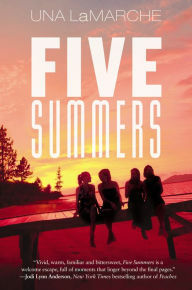 Four girls spent five summers together at a camp in New England. Three years after their last summer together, they've come back for a camp reunion. They approach their gathering with mixed emotions, but they all underestimate how much they had changed since those summers. Coming back together highlights not just those changes, but also exposes secrets that they never revealed to each other in the past, despite their closeness. Doing so now threatens to destroy friendships that they expected would last forever. This is the novel I thought Proof of Forever (reviewed a month ago) was going to be (and it would have been albeit for it's weird fantasy twist) -- a story of childhood friendships revisited and infantile relationships matured. There's a tremendous potential emotional punch here as the girls strip each other bare through sheer familiarity. However, LaMarche has trouble delivering that punch. The first 250 pages of this novel dragged for me as we traveled through rising tensions and unrevealing flashbacks. In the last 100 pages, the book starts to pay off and the actual climactic blow up is gripping, but it deflated fast afterwards. I liked the girls and their quirks and differences were well-portrayed. The setting felt authentic and sent me back on a nostalgic trip through my own experiences with sleep-over camp in New England. But the story just dragged and then, just as it was getting interesting, came to a screeching halt. Unlike her more compelling sophomore effort (Like No Other), this first novel doesn't stand out.